In order to continue to offer these and other services we need your assistance. 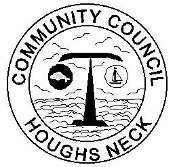 Membership in the Houghs Neck Community Council is $7.00 per family. Only seven dollars helps bring the Bulletin to your door every month with your name listed on the membership page. The Houghs Neck Community Council is a 501-c3 nonprofit organization and 100% volunteer so your tax-deductable donation and membership dues goes directly back into the community. Copyright © 2008-2019 Houghs Neck Community Council. All rights reserved.